Whole grain bagels are a great alternative to sandwich bread — they’re compact and when cut in half, they fit perfectly into most lunchboxes. The combination of a smear of organic cream cheese and a layer of sweet pickles add a burst of tangy sweetness that will delight even the pickiest of eaters. If you child hasn’t tried hummus, now is the time to introduce this delicious fiber packed spread to their meals. Add a layer organic hummus to a whole grain pita, then layer with a combination of diced cucumber, tomato, red pepper, Bermuda onion and any other veggies that you child loves. To finish it off, slice the pita into pizza-like wedges. Another alternative is to swap the pita for a tortilla. This power-packed pita will give your child the boost of energy that they need to get through their day. A great alternative to peanut butter is almond butter. 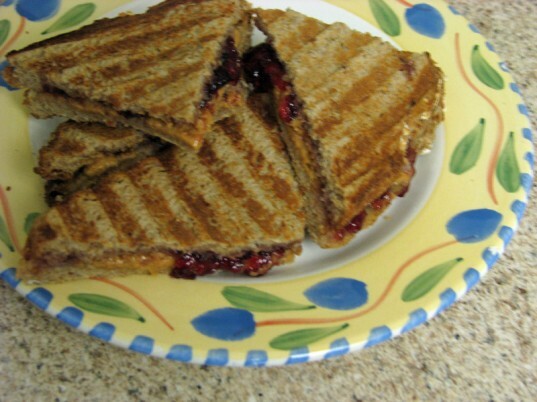 When you place an almond butter and jelly sandwich in the panini press for a couple of minutes, you take ho-hum to yum-yum. Your child will love the familiar taste of PB&J, but with a crispy, gooey and crunchy twist. What child doesn’t love Nutella? It’s what would happen if cocoa and hazelnuts fell in love. 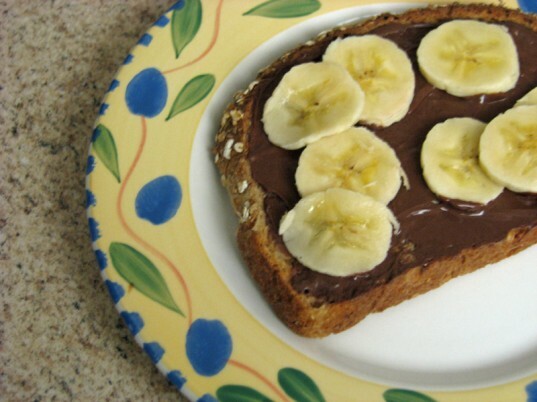 This chocolaty nutty spread is taken to a whole new level when you add a thin layer of bananas to the mix. And what a fantastic way to work fruit into a sandwich. It’s like a banana split sandwich — almost. This is, hands down, my son’s favorite lunch sandwich. 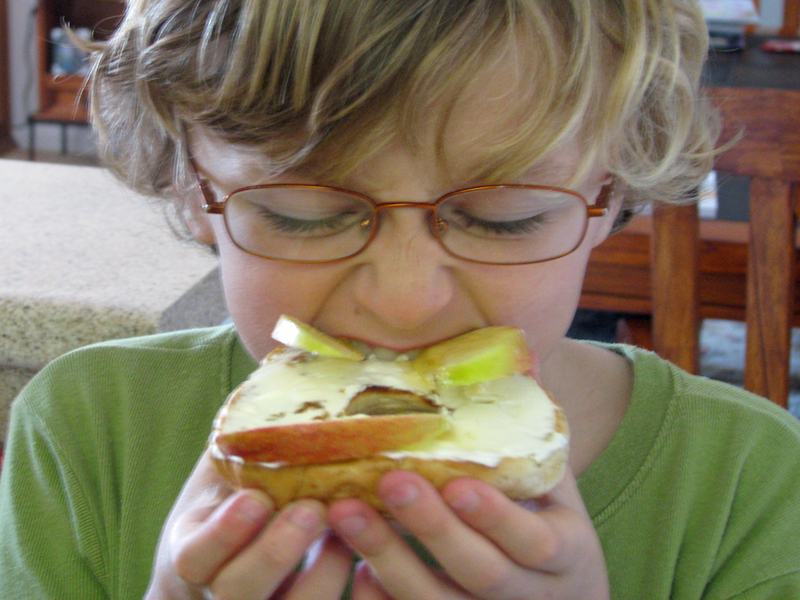 A simple organic whole grain bagel with a schmear of organic cream cheese, layered with apple slices and then drizzled with honey. This is a lunch bagel that he devours and then asks for another. The combination of sweet honey and crisp apple on a chewy toasted bagel is delicious and created with just four fantastic ingredients. Add a small amount of fresh minced dill to your favorite organic cream cheese. Then, spread a thin layer all over a tortilla. Sprinkle a combination of finely chopped tomatoes, cucumber and any of your other favorite veggies. 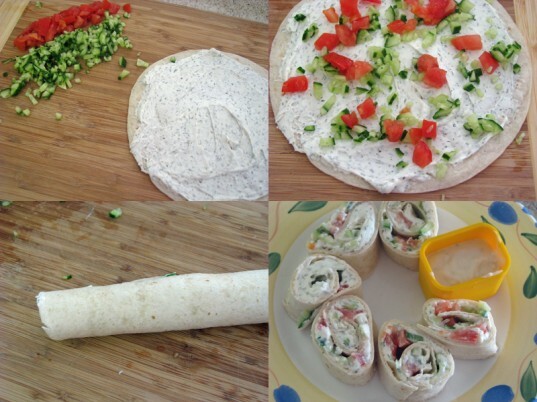 Then, roll up the loaded tortilla like a burrito and slice it into wheels. This roll up is delicious when served with a side of fresh organic ranch salad dressing for dipping. Cut up your favorite organic soft pita into medium sized wedges and top with a thick layer of organic guacamole and a thin layer of tomatoes. You will want to serve the guacamole and tomato on the side so the pita doesn’t get soggy. Think of it as a yummy twist on mini pizza slices. 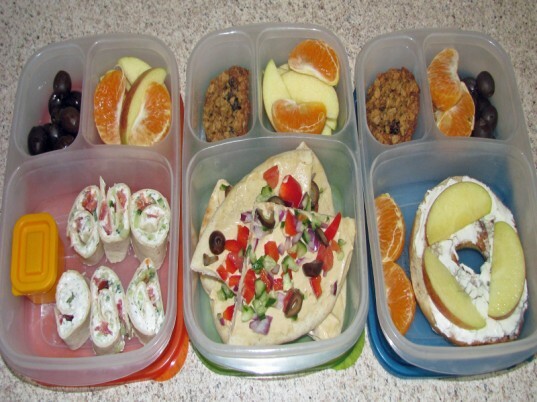 All of these alternatives fit perfectly into a lunchbox as part of whole balanced lunch. I like to make sure that the 6 Essentials to Pack in Your Child’s Lunchbox are always included. You can take organic chocolate spread instead, there are a lot of brands that exist. :-) Thank you for all these creative ideas! Whole grain bagels are a great alternative to sandwich bread -- they're compact and when cut in half, they fit perfectly into most lunchboxes. 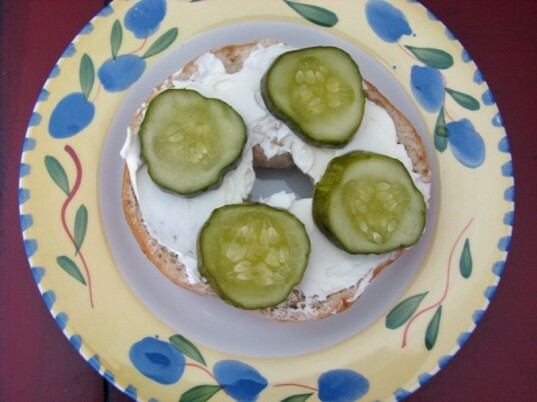 The combination of a smear of organic cream cheese and a layer of sweet pickles add a burst of tangy sweetness that will delight even the pickiest of eaters. If you child hasn't tried hummus, now is the time to introduce this delicious fiber packed spread to their meals. 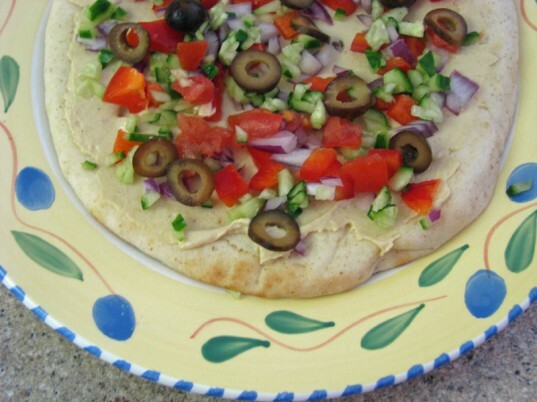 Add a layer organic hummus to a whole grain pita, then layer with a combination of diced cucumber, tomato, red pepper, Bermuda onion and any other veggies that you child loves. To finish it off, slice the pita into pizza-like wedges. Another alternative is to swap the pita for a tortilla. This power-packed pita will give your child the boost of energy that they need to get through their day. What child doesn't love Nutella? It's what would happen if cocoa and hazelnuts fell in love. This chocolaty nutty spread is taken to a whole new level when you add a thin layer of bananas to the mix. And what a fantastic way to work fruit into a sandwich. It's like a banana split sandwich -- almost. This is, hands down, my son's favorite lunch sandwich. 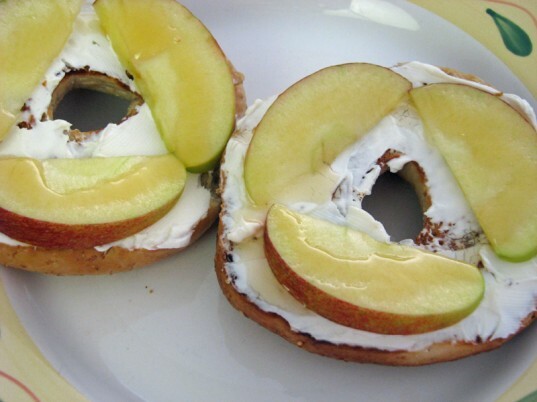 A simple organic whole grain bagel with a schmear of organic cream cheese, layered with apple slices and then drizzled with honey. This is a lunch bagel that he devours and then asks for another. The combination of sweet honey and crisp apple on a chewy toasted bagel is delicious and created with just four fantastic ingredients. Cut up your favorite organic soft pita into medium sized wedges and top with a thick layer of organic guacamole and a thin layer of tomatoes. 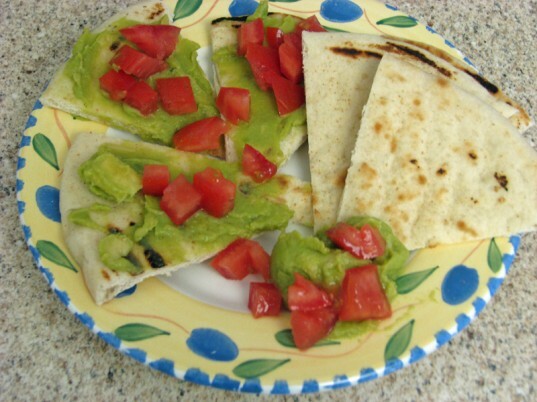 You will want to serve the guacamole and tomato on the side so the pita doesn't get soggy. Think of it as a yummy twist on mini pizza slices. All of these alternatives fit perfectly into a lunchbox as part of whole balanced lunch. I like to make sure that the 6 Essentials to Pack in Your Child's Lunchbox are always included.